Sloan was a member of the Association of American Painters and Sculptors served on the Reception and Publicity Committee for the Armory Show. But by January 1913 he had become dissatisfied with the organization of the exhibition, writing: “I can’t feel interested enough to attend the meetings lately. They are going to show what they think ‘good in art’!”  Nevertheless, he exhibited two paintings and five etchings at the Armory that reflected the urban realist subject matter for which he was known. Overall, Sloan viewed the Amory Show as having a positive impact on American art, and he declared the modern movement a “powerful and efficacious drug” to cure the reliance on nineteenth-century academic art. The exhibition also had a profound impact on his own art. Works by Pierre-Auguste Renoir, Paul Cézanne, Vincent van Gogh, and Pablo Picasso particularly inspired him to dispense with the narrative and social content that had been the hallmark of his urban realist paintings in favor of an emphasis on color and plasticity of form. 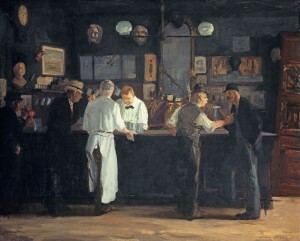 Valerie Ann Leeds, “McSorley’s Bar,” in American Paintings In the Detroit Institute of Arts (New York: Hudson Hills Press, 1991-2005), 245. John Sloan, John Sloan’s New York Scene; From the Diaries, Notes, and Correspondence 1906-1913, Bruce St. John, ed., (New York: Harper & Row, 1965), 628-29. In later years Sloan continued to express his displeasure with the show, which he felt had been co-opted by Walt Kuhn and Arthur B. Davies. William B. M’Cormick, “Success of International Exhibition Disproves Statements That Art is Dead,” New York Press, March 2, 1913, 2:6. “Art Extremists, in Broadsides of Lurid Color, Invade New York and Capture an Armory,” New York Herald, February 17, 1913, 10. The John Sloan Manuscript Collection, 7.